Wolfram Mathematica is a modern computational software that handles all facets of technical computing including machine learning, visualizations, data science, geometry, image processing, and neural networks. It’s a cutting-edge system built on symbolic mathematics for endless use in computing, mathematical, scientific, and technical fields. The solution offers unprecedented capabilities, and it can calculate, model, graph, and present multifaceted ideas used in academic and industrial research. Wolfram Mathematica offers an integrated and continually expanding system that is available for on-premise deployment. Better still, the Mathematica Online is a robust module that is seamlessly available in the cloud via any web browser. The platform features over 5000 carefully integrated, built-in functions that cover the breadth and depth of technical computing. 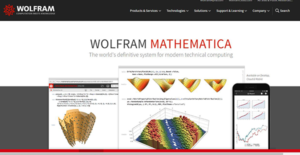 Wolfram Mathematica is a powerful software that stands alone in a range of dimension and is unique in its support for the modern technical computing workflows and environment. It’s a reliable solution that combines the power of Wolfram’s core technologies and the unprecedented algorithmic supremacy to create a platform that is uniquely easy to use. The system utilizes the inimitable capabilities of Wolfram Language and exclusive development methodologies to build exceptional algorithms. The Wolfram Language features a coherent design and English-like function names which make it easy to learn, read, and write. The solution front-end provides an interactive graphical user interface that allows you to create and edit Notebook documents. This Wolfram Notebook Interface permits you to shape everything you do in rich docs that include runnable code, text, dynamic graphics, and more. Documents can be formatted using the hierarchy of cells which permit sectioning and outlining of the document while offering support for automatic numbering index creation. All content formatting can be created algorithmically or modified interactively. In addition, all basic word processing functionalities are supported including the real-time, multilingual spellchecking. Wolfram Mathematica allows you to enhance the look of your results. It offers sophisticated computational aesthetics that allow you to create publication-quality documents with top-of-the-line interactive visualizations. On the other hand, the Mathematica Online module brings the power of this system to the modern cloud environment. It allows you to leverage the power of the interactive notebooks in the cloud without the need for any configurations or installations. If you are considering Wolfram Mathematica it may also be sensible to examine other subcategories of Best Predictive Analysis Software collected in our database of B2B software reviews. There are trendy and widely used applications in each software category. But are they automatically the best fit for your enterprise’s special needs? A market-leading software solution may have thousands of customers, but does it present what you require? For this reason, do not blindly shell out for popular systems. Read at least a few Wolfram Mathematica reviews and consider the elements that you want in the software such as the fees, main tools, available integrations etc. Then, shortlist a few solutions that fit your wants. Try out the free trials of these products, read online opinions, get explanations from the seller, and do your research systematically. This exhaustive homework is sure to aid you select the best software platform for your company’s unique needs. How Much Does Wolfram Mathematica Cost? We realize that when you make a decision to buy Predictive Analysis Software it’s important not only to see how experts evaluate it in their reviews, but also to find out if the real people and companies that buy it are actually satisfied with the product. That’s why we’ve created our behavior-based Customer Satisfaction Algorithm™ that gathers customer reviews, comments and Wolfram Mathematica reviews across a wide range of social media sites. The data is then presented in an easy to digest form showing how many people had positive and negative experience with Wolfram Mathematica. With that information at hand you should be equipped to make an informed buying decision that you won’t regret. What are Wolfram Mathematica pricing details? What integrations are available for Wolfram Mathematica? If you need more information about Wolfram Mathematica or you simply have a question let us know what you need and we’ll forward your request directly to the vendor.